Mappe-Monde sur la Projection de Mercator. 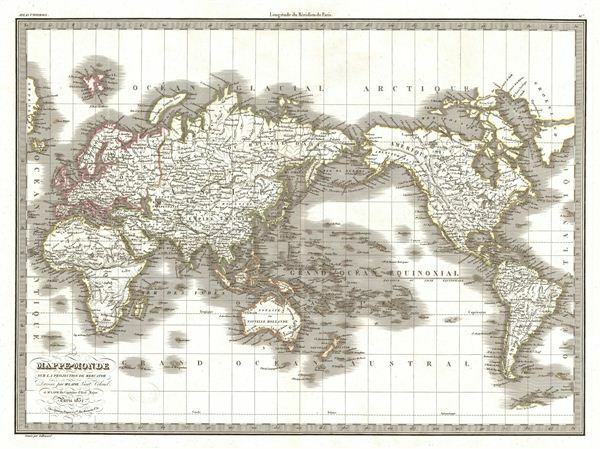 A fine first edition example of M. Lapie's 1831 map of the world on a Mercator projection. Lapie's map offers fine detail throughout with elevation rendered by hachure and political boundaries demarcated with outline hand color. A stunning map, Lapie very curiously centers his chart on Australia (Nouvelle Hollande), with the old and the new worlds appearing to the left and right, respectively. Cartographically it represents the most up to date discoveries of the time though limited geographical knowledge, particularly in Africa, Australia, and Central Asia, is in evidence. In Africa there is no trace of the great Rift Valley lakes and the source of the White Nile is set in the speculative Mountains of the Moon. The interior of Australia is blank though the coastal colonies around Botany Bay, including Sydney are noted. The disputed sea between Japan and Korea is here identified as the 'Sea of Japan.' This map was engraved by Armand Joseph Lallemand as plate no. 16 in the first edition of M. Lapie's important Atlas Universel. This map, like all maps from the Atlas Universel features an embossed stamp from the Lapie firm. Pierre M. Lapie (fl. 1779 - 1850) and his son Alexandre Emile Lapie (fl. 1809 - 1850) were French cartographers and engravers active in the early part of the 19th century. The Lapies were commissioned officers in the French army holding the ranks of Colonel and Capitan, respectively. Alexander enjoyed the title of "First Geographer to the King", and this title appears on several of his atlases. Both father and son were exceptional engravers and fastidious cartographers. Working separately and jointly they published four important atlases, an 1811 Atlas of the French Empire (Alexander), the 1812 Atlas Classique et Universel (Pierre), the Atlas Universel de Geographie Ancienne et Modern (joint issue), and the 1848 Atlas Militaire (Alexander). They also issued many smaller maps and independent issues. All of these are products of exceptional beauty and detail. Despite producing many beautiful maps and atlases, the work of the Lapie family remains largely underappreciated by most modern collectors and map historians. The later 19th century cartographer A. H. Dufour claimed to be a student of Lapie, though it is unclear if he was referring to the father or the son. The work of the Lapie firm, with its precise engraving and informational density, strongly influenced the mid-19th century German commercial map publishers whose maps would eventually dominate the continental market. Armand Joseph Lallemand (c. 1810 - 1871) was an engraver and map publisher based in Paris during the mid-19th century. Most of Lallemand's work focused on landscapes and building vies, though he did take part in a few cartographic ventures, including the production of an atlas with Alexandre Emile Lapie and several tourist pocket maps of Paris. Very good. Original platemark visible. Blank on verso. Original centerfold.